Ezequiel Sanchez, 9, plays the tuba during a performance by Boston Area Brigade of Activist Musicians at a rally on Boston Common. 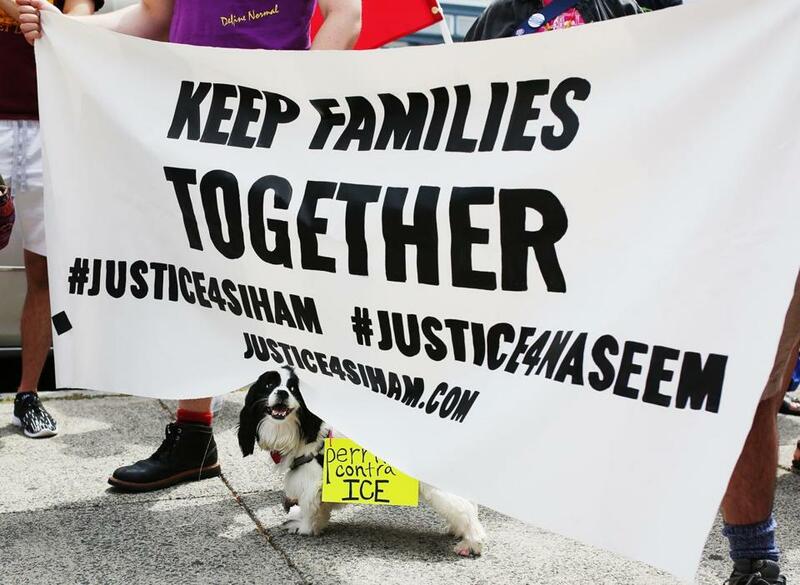 People holding signs saying “Trump is not my President” and “Abolish ICE” lined the sidewalk during a recent political demonstration in Jamaica Plain. A slew of speakers, including immigrants and beauty pageant winners, bemoaned President Trump’s “zero-tolerance” immigration policy separating families at the US border. But perhaps the most stirring part of the protest was the sight and sound of 9-year-old Ezequiel Sanchez playing a tuba, leading a group of about 10 musicians in a rendition of “We Got That Fire” by the Lil’ Rascals. 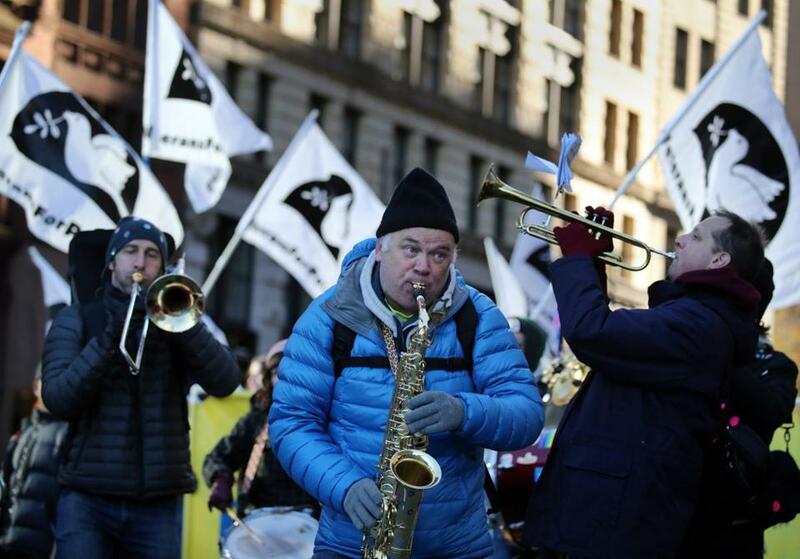 The players, including Ezequiel, are members of the Boston Area Brigade of Activist Musicians, a loosely organized rapid-response band that teams up with event organizers to play at demonstrations and rallies around social justice and civil rights issues. The collaboration makes for an intersection of music and protest some say goes back to the civil rights movement of the 1950s and ‘60s. “What if we had a volunteer fire brigade, except it was a volunteer musicians brigade?” said David Brancazio, one of the group’s founders who plays the piano, melodica, slide whistle, and various percussion instruments, when asked to describe his band of like-minded performers. The group, which calls itself BABAM, grew out of a series of brass street bands in 2016 — dubbed honk bands — around Greater Boston and brings together its members through an online alert system. Its mission is to help provide a more lively atmosphere during public demonstrations, said Brancazio. Using a website called Gig-o-Matic, which was created by a member of Somerville’s Second Line Brass Band, arranging a “gig” is simple. Organizers contact BABAM about an upcoming event, and an e-mail goes out to its nearly 200 members. Those who can attend sign up, and they figure out the musical arrangements and set list once they are there. On-site organization can sometimes be difficult, as the group does not hold regular rehearsals and the number of players who show up for a given rally, and what instruments they play, varies. “Sometimes instead of a dozen musicians showing up, two musicians show up, and it might be a melodica and trombone and we need to figure some things out on the fly,” Brancazio said. The performers, all unpaid volunteers, draw from a playbook of well-known songs including “When the Saints Go Marching In” and “This Little Light of Mine,” which they can learn from BABAM’s website. Organizers will often also request specific songs, with the goal being to give an event energy, engage demonstrators, and attract passersby. 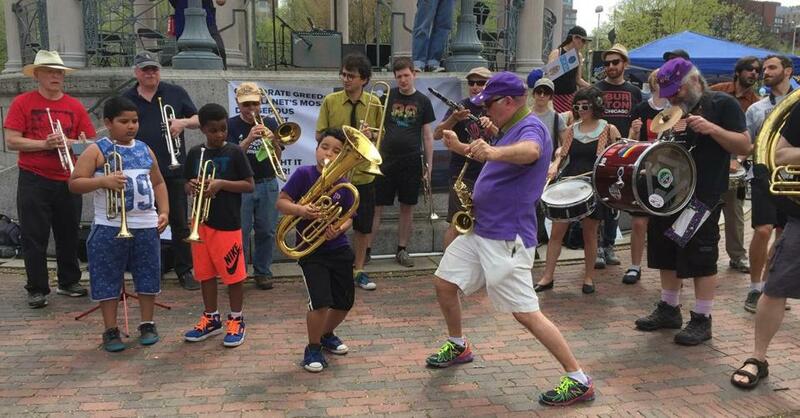 Ezequiel, the 9-year-old, does draw a lot of attention when he plays the tuba, dancing as he hits the notes. He said he has played with BABAM for about 1½ years, after teaching himself to play the guitar, trumpet, and now tuba. “They’re really fun people to play with,” he said of other brigade members. The brigade’s first gig was playing at a demonstration for “Fossil Free Somerville” in April 2016. Since then, Brancazio said, it has played at more than 80 events ranging from immigration rallies outside the US Immigration and Customs Enforcement detention center in the South End, to protests raising awareness of gentrification in Jamaica Plain and Dorchester. The group, which calls itself BABAM, grew out of a series of brass street bands in 2016 — dubbed honk bands — around Greater Boston and brings together its members through an online alert system. One of the best things about the band, other members say, is that it welcomes all, regardless of their musical experience. Mary Bradley, 53, joined BABAM several months ago after picking up the trombone at the so-called School of Honk, a group that holds weekly sessions on Sundays where beginning players get a chance to practice playing and marching to common honk tunes in a largely informal setting. Bradley said there is a sense among many progressives in Massachusetts that their votes often don’t matter, since the state skews liberal. For Betty Widerski, 63, who also recently learned to play the trombone, joining BABAM allowed her to get politically involved again after undergoing treatment for breast cancer. “One of my big skills is my musicianship, and being able to use my music in support of people who are putting their lives and bodies on the line to stop some of the more horrendous political events of late is a good use of my time,” Widerski said. For event organizers, the music BABAM provides is crucial. Ponte-Capellan said when City Life evaluates its events, the music always ends up in the “pro” category of the debriefing. Brancazio said one of his goals for the group is to strengthen its relationships with protest organizers to effect policy change on a larger scale. Creating positive change is a goal Erika Sanchez, Ezequiel’s mother, fully supports and hopes her son will embrace as he grows older. Using a website called Gig-o-Matic, which was created by a member of Somerville’s Second Line Brass Band, arranging a “gig” is simple.